We value happy experience and 100% satisfaction of each customer, hence, we are very grateful to have a chance to get any suggestion and information from you, So please feel free to let us know if you have one. We devote to improving our products and making progress. Magic Gate Portable Folding Safe Guard Install anywhere.Pet safety Enclosure.This safe gate is the easiest and most discrete way to protect pets all around the house. It's recommended for small pets and it can be moved from one place to another in the house when needed. When not in use, the gate takes minimal space and blends perfectly to your home and decor, with a simple, but elegant design. 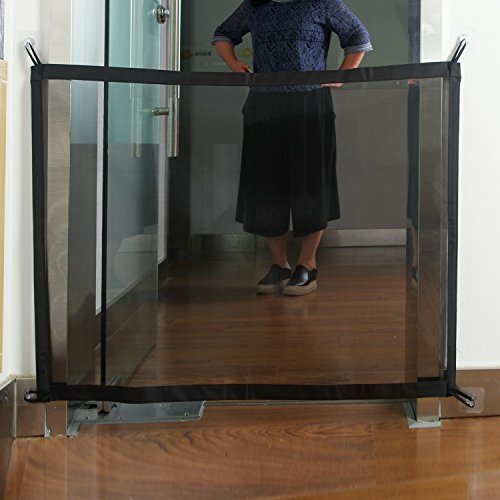 This gate is 29.5 inches/ 75 cm tall and expands to 39 inches/ 100 cm wide.Pet safety enclosure perfect for doorways, between walls, or stairwells, indoors and outdoor. Completely assembled for immediate use. No tools required ; Lightweight and portable to meet all your on-the-go needs. Built with tough partially see-through woven mesh fabric woven to withstand abuse from pets.Unique woven barrier that easily retracts to fully or partially quick pass-through.Completely assembled for immediate use. No tools required. Lightweight and portable to meet all your on-the-go needs.Each Set Includes one fabric woven, two matchable poles and four sticky hooks. If you have any questions about this product by THREEMAO, contact us by completing and submitting the form below. If you are looking for a specif part number, please include it with your message.